FILE - FIFA (International Football Federation Association) outside the organization's headquarters in Zurich. Former FIFA Vice President Jeffrey Webb has been extradited from Switzerland to the United States to face racketeering and bribery charges. Webb, who is from the Cayman Islands, was president of CONCACAF, soccer's governing body for North and Central America and the Caribbean, and a FIFA vice president at the time of his arrest. A U.S. indictment issued in May charges nine FIFA officials and five corporate executives with offenses that include racketeering, wire fraud and money laundering. Among them was former FIFA Vice President Jack Warner, who is resisting extradition from Trinidad and Tobago. 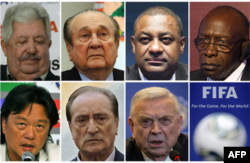 Thje FIFA executives indicted include , top, from left, Rafael Esquivel, Nicolas Leoz, Jeffrey Webb and Jack Warner. Bottom, from left, Eduardo Li, Eugenio Figueredo and Jose Maria Marin. Webb was one of seven people — all from South America or the CONCACAF countries — arrested in a dawn raid on a Zurich hotel in May. The men are accused by U.S. authorities of involvement in more than $150 million worth of bribes given for marketing deals for football tournaments in North and South America. A separate Swiss investigation has been looking into allegations of mismanagement and money laundering connected to the awarding of the 2018 and 2022 World Cups to Russia and Qatar, respectively. FIFA has suspended the bidding process for the 2026 World Cup because of the controversy. A week ago, FIFA expelled former Executive Committee member Chuck Blazer, who admitted accepting massive bribes and became an informant in a U.S. government investigation that has shaken the world football body. The 70-year-old, well-known for his opulent lifestyle and larger-than-life personality, is now wheelchair-bound and seriously ill from cancer in a New York hospital. He was an ally of FIFA President Sepp Blatter, who has agreed to step down in the wake of the scandal.